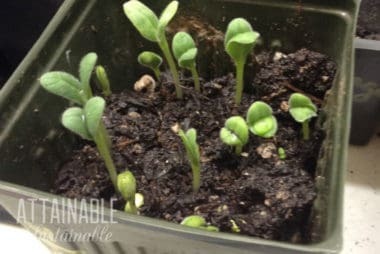 Growing a turmeric plant at home is easy! Here’s how to add this root to your spice (and medicine) cabinet. ​Turmeric is the main spice in yellow curry, giving it its warm flavor and golden coloring. Ongoing research suggests that turmeric may have extensive health benefits as well. Grown for its root, it’s much like ginger. And here’s the cool thing about it: growing turmeric is easy. Of course, I live in a tropical region which means I can grow this healthy tuber outside, but those of you who live in cooler climes can learn how to grow turmeric — even if you grow it in containers. Most recipes call for the dried powder standard on your grocer’s spice rack, but if you’ve got fresh tubers on hand, you can use it instead. Admittedly, finding the roots might be harder than learning how to grow turmeric. Fresh turmeric — here it’s called ‘olena — is pretty readily available at our farmers markets. If you live in a cooler region, you might have better luck checking Asian supermarkets. It’s also available to order online. 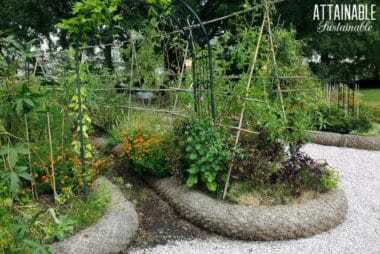 Work the ground well and incorporate some compost into your planting area. Separate rhizomes into fingers that each have at least two buds. Plant, buds up, about 2-3″ deep and 12″ apart. Leaves should start to appear in four to six weeks. The plants have lovely wide leaves and can work easily as part of a front yard landscape, so long as they’re placed somewhere that can be dug up once a year or so. Use a pot that’s roughly 12″ wide and just as deep. 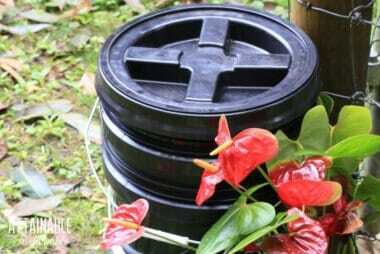 Fill with good quality potting soil, and set rhizome 2-3″ deep. You’ll only plant one finger in each pot. Turmeric likes it warm and will be fine outside during the summer months, so long as you keep the soil damp. It’s freezing weather that’s a problem — you don’t want the roots to freeze. You can start your turmeric plant inside during the early spring, move it outdoors for garden season, then — if it’s not ready to harvest yet, move it inside again when it starts to get cold. 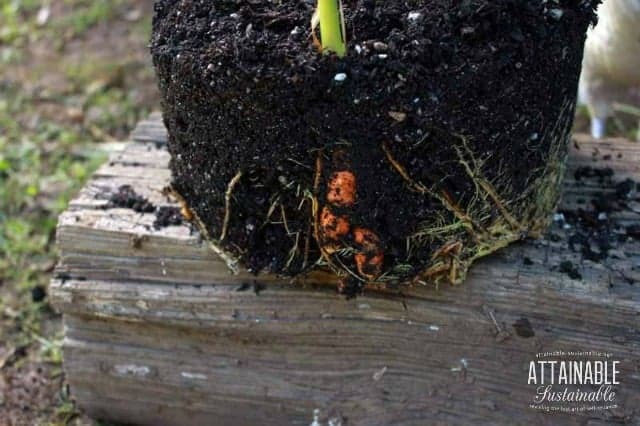 Whether planted in the ground or in a pot, your turmeric plant will appreciate some protection from the hot midday sun. 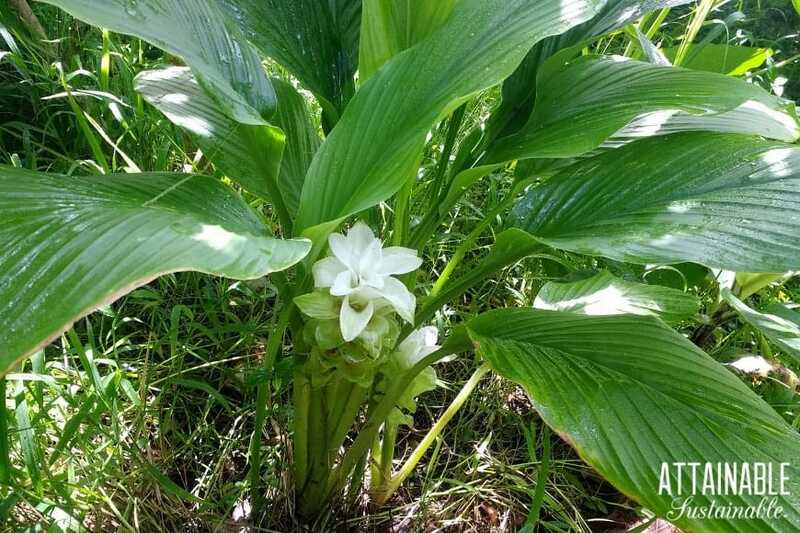 Turmeric roots are actively growing when the leaves are a lush green. When the leaves start to brown and die back, it’s time to harvest. There are two ways you can do this. One, use a shovel to dig up the entire root ball. 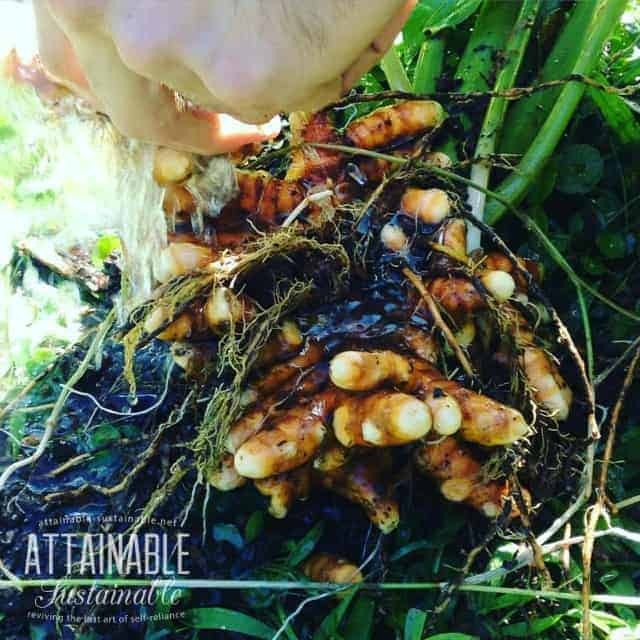 Alternatively, you can harvest just some of the turmeric by loosening the soil around the plant and harvesting from the outer part of the root ball. Leave the main portion of the root ball intact, much as you would harvest new potatoes. The plant will sprout green leaves again when it comes out of its dormancy, and produce fresh rhizomes. With this method, the center part of the root ball will get dark and soft. If you pull up an older plant, be sure to use just the robust bright orange fingers. Wash the soil away from the roots and store in a cool, dry place. You’ll replant some of those rhizomes to start fresh plants. If the tubers start to sprout in storage, plant them as described above. If you’ve ever used turmeric, you know that it stains terribly. Spill it on your counter, get it on your hands; the yellow will last for quite some time. So you won’t be surprised to know that turmeric has been used as a dye for centuries. 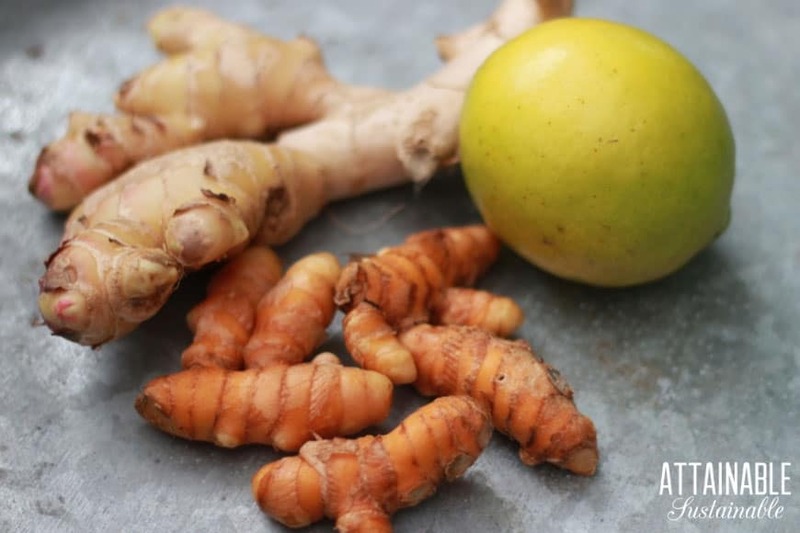 While lately turmeric is the talk of the town — so to speak — in natural healing communities, its use as a nutritional supplement or herbal treatment is not new. These days, there’s discussion about its ability to aid osteoarthritis pain, reduce inflammation, or even assist in the treatment of cancer, but it’s been used medicinally for a long time. 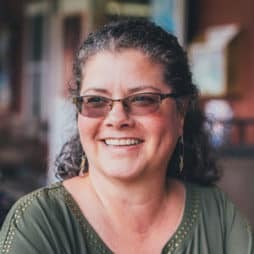 PBS talks about the history of turmeric and its medicinal uses. Inhaling fumes from burning turmeric was said to alleviate congestion, turmeric juice aided with the healing of wounds and bruises, and turmeric paste was applied to all sorts of skin conditions – from smallpox and chicken pox to blemishes and shingles. We love this sore throat soother made with turmeric, honey, ginger, and lemon and this turmeric milk. The dried powder will keep longer than the fresh roots. If you prefer keeping the powder on hand, you can make your own. Head over here to find out how. You can use fresh turmeric from your homegrown turmeric plant in place of powdered in recipes. Substitute a one-inch piece of turmeric for one teaspoon of the ground spice. You’ll want to grate it finely for most recipes. One of the easiest ways to incorporate this healthy spice into your diet is to simply toss a piece of the fresh root into a smoothie. A one inch piece will do nicely; add more if you’re especially fond of the flavor it brings. Ok, you had me at Butter Chicken and Chicken Shawarma. Now I’m drooling…I may have to change the menu tonight…. Thanks for sharing my Fire Cider recipe. We’ve been eating a lot of Indian food lately and loving it. Thank you for your Turmeric information. I just getting worst with my arthritis pain in my hands and my Doc, who know I don’t want chemicals in my body, recommend Turmeric. I bought the roots today, will grow my own and start to use it everyday. I may will be blessed and released of the pain. I’ve been kicking around the idea of growing if for awhile – maybe this will give me the push I need. My biggest problem is that I stink at indoor plants and would need to bring this in for the winter. Sound like I just really NEED my greenhouse. Turmeric is a very good reason to finally build the greenhouse! What about storing your harvest? 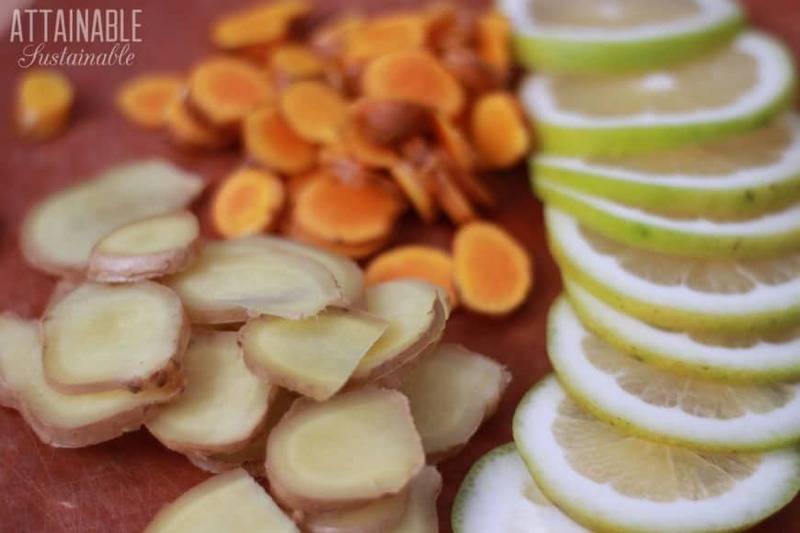 If you don’t dry the root and create powdered turmeric, can the root be stored in any way? It lasts quite awhile, like fresh ginger. I washed mine up and have some in the fridge, and some in a cool, dry place. So far they’re fine and it’s been a couple of months. I’ve also heard that you can freeze it. after harvesting my turmeric, I grate the root and freeze them on a pie dish. Spread a thin layer on the dish to freeze overnight. Leave the dish on the counter for a few minutes. Using a butter knife, lift the turmeric. Break into small pieces and place in a wide mouth glass jar. Return to the freezer. Use as needed. Have been wanting to grow turmeric for some time now but can’t find out anywhere how long a growing season I need. I live in northwest Ohio and typically our growing season (frost-free) is from mid May to mid October. Is 5 months long enough to mature this plant? I imagine I can store the roots to replant the following year as I would with canna’s, dahlia’s, etc. Is growing fresh turmeric in my future or should I just stick with the powdered form where I am unsure of the purity or freshness? Thank you very much. The growing season is *about 6-8 months. If you want to try it, I’d plant some in a pot a couple months early and keep it inside to get started. Once it warms up, move it outside. Do I peel the root before I slice it for dehydrating? The fresh root is pretty soft and should be fine if you leave it in place. Just wash it well. I believe Baker Creek Seeds had them in their catalog last year. If you have a big Indian(Hindu) community in your area you will find their vegetable store carry this roots. I just bought some and started its propagation. Good luck to you. What is the preferred pH level for this plant? Oh, goodness. That’s not something I tested. Are there any interactions with medication such as warfarin or diabetes/ blood pressure meds? This I don’t know. I’d ask your doctor. I would like this article if I can. How can I get a copy? There’s a green “print” button at the bottom of the post. I found fresh turmeric roots at Whole foods. $20 plus / pound. I bought 2 small pieces and planted them in a pot.They are doing great. We have a few international farmers markets in our area, where I can buy turmeric for under $10.00/lb. organic. I’m surprised to hear it’s so expensive in other areas. There’s a great reason to grow it!